Hosted Projects and Completed Maps. 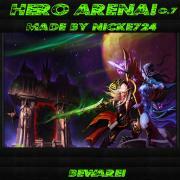 11 heroes, 2 teams, quests, bosses, challenges, duels, epic items, abilities fully made by me. Welcome to a bloodfest in my finally finnished hero arena! Updated to 0.5, the host can now decide if the game goal should be most kills after a certian amount of time or the first team that achives a certian amount of kills. Also removed the antistuck ability and created a new one that will go off when you write "-stuck". Kiljaeden also drops the promised ultimate wepeon now. Updated to 0.6, Removed some buggs here and there, created another antistuck command that is alot better than the first one but that should only be used in case of emergency. Also I balanced the heroes a little more and edited new cool items. Updated to 0.7, balanced it alot and removed some bugs. Added more items and nerfed the Stop time item, it now only stops the nearby units instead of the entire map. If you download a map, feel free to come back and leave feedback. Your comments and opinions help authors make better maps.